Naomi Vanderkindren makes photographs that are a fascinating combination of the past and the present. 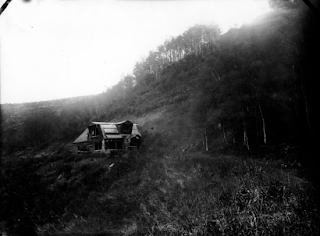 She uses a unique adaptation of the dry plate photographic process that was developed in the late 19th century to infuse her pictures of abandoned buildings and old mining towns with an added layer of memory. Making a photograph with a dry plate process involves coating glass with a light-sensitive emulsion, and then printing from the "negative" that forms on the glass after it has been exposed to light. One of the characteristics that distinguishes Vanderkindren's work is that she uses glass that has been salvaged from windows and other sources, so that the artifacts that show up in the final print carry the history of the glass itself, as well as the history that is being recorded in the scene. 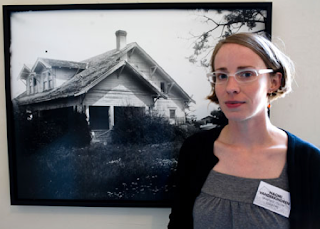 The photographs that she exhibited at an open house on Sunday at the Headlands were made from negatives that she captured on a four-week tri p along Route 50 from California to Colorado. She brought along about 600 glass plates that she stowed in boxes that she built herself for the purpose. She used a 4x5 camera to make the exposures. There's both irony and poignancy in the results. The large and beautifully toned gelatin prints look like they might have been taken at the time the buildings were new; the lush black and white photos are beautifully, and uniquely, flawed. The vignetting and spotting comes not from shortcomings in the lens or from from photoshop tricks, but rather from variations in the glass plates themselves. The glass has already had a life of its own, and applying the emulsion by hand results in interestingly uneven coverage. The resulting prints are one-of-a-kind, incapable of being repeated. Vanderkindren, a graduate of Stanford who had a recent fellowship at the at the Headlands Center for the Arts, says she regards her photographs "as autobiographical fictions: Interpretations of the world that stem from and contribute to distortions of memory."